This page is meant to educate and equip you to better care for your paintings and art works. It gives practical advice applicable to everybody’s needs and is also an introduction to conservation and restoration. However, these are specialist areas which require advanced technical skills and experience. Emphasis in the past was on restoration of the painting to its former glory. This often included substantial ‘creative’ painting restoration in addition to cleansing. Nowadays, conservation is emphasised which includes careful cleaning and measures to stabilise the painting. The target for most collectors is preventive conservation i.e. to prevent deterioration, and the need for active treatment is reduced. All paintings begin to change from the moment the painter finishes work on them. The effects of natural aging, light, heat and humidity, and accidental damage all take their toll. Natural aging is intrinsic to the materials of the painting. Pigments fade or change colour, the medium changes character and renders the paint more transparent, crack patterns (craquelure) develop as the paint dries, contracts and moves with the support. Some of these alterations are obvious, some more subtle. The most important preventive measure anyone can do to protect their art works is to avoid direct sunlight since it can change the colours of the pigments and cause colours to pale over a period of time. The second measure is to avoid extremes in terms of temperature and humidity, and in particularl sudden and large fluctuations in temperature and humidity. A stable ‘room-temperature’ climate is the most favourable for art works. 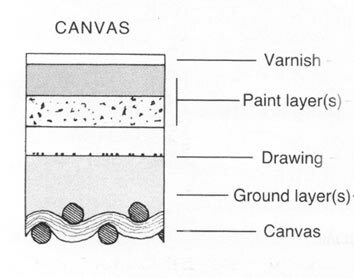 Most canvas paintings have a broadly similar layered structure. It begins with the canvas and then work up through the preparation ground or priming, the paint layers, and the varnish. The paint layers themselves are composed of coloured pigments mixed with a binding medium, often a drying oil. They can vary enormously in thickness and complexity from thin transparent washes (glazes) to thick opaque textured brushwork (impasto). Certain pigments are more stable than others in terms of resisting influence by light, humidity, etc. Varnishes, consisting of of natural or synthetic resins, invariably discolour with time and this is one of the reasons why pictures are cleaned. Oil paintings have shown to be durable over the centuries. Oil paintings should be stored stretched and possibly framed. Only when they are relatively new can they be rolled up. Over time, the paint becomes harder and more brittle. Hence, paint can start to crack and flake if care is not taken to store the paintings properly. All active interventions to the painting should be handled by experts only. Professionally, cleaning of a painting is defined as the removal of dirt, discoloured varnish layers and non-original repaints from its surface. Only the expert can decide on this particular painting’s characteristics in terms of varnish, pigments, binding materials, and so on and the necessary intervention needed. An amateur’s efforts often causes havoc. The only thing a layman collector can do is to wipe the surface clean with a soft piece of cloth. Acrylic paintings use water as a solvent rather than derivatives from oil. The pigments are often brightly coloured and they dry faster than oil paintings. Often, they are not varnished. In terms of preventive conservation, they are treated in a similar way as oil paintings. Lacquer paintings are normally durable and resistant to many kinds of external impact. The board may warp sometimes, but it can be straightened out in a strongly built frame. Since the board itself is made from plywood, cotton, clay and layers of lacquer, it will normally not crack, though extreme cold or dryness should be avoided. The surface of a lacquer painting can be polished by the palm of a hand. Small pieces that have fallen of a lacquer painting can be glued on to it, though more extensive damage must be repaired by an expert, likely a Vietnamese expert, since they are the masters of lacquer painting. 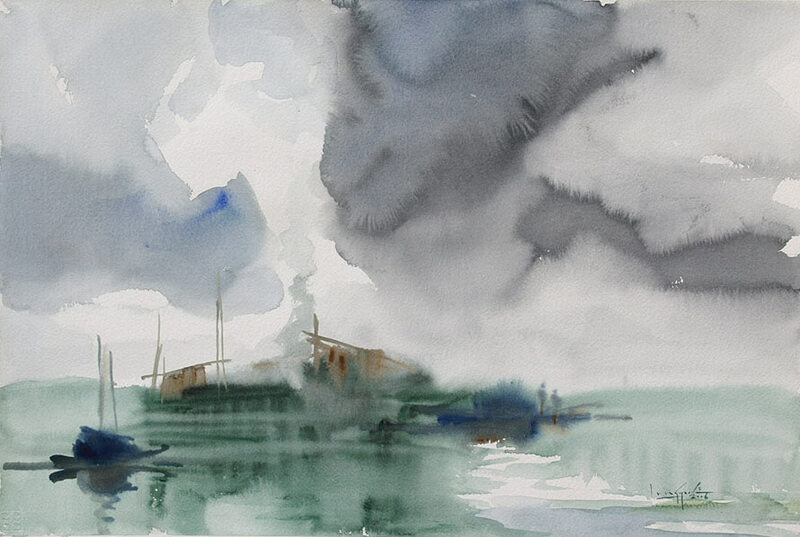 Works on paper, drawings and watercolour, are the most sensitive to external influences. 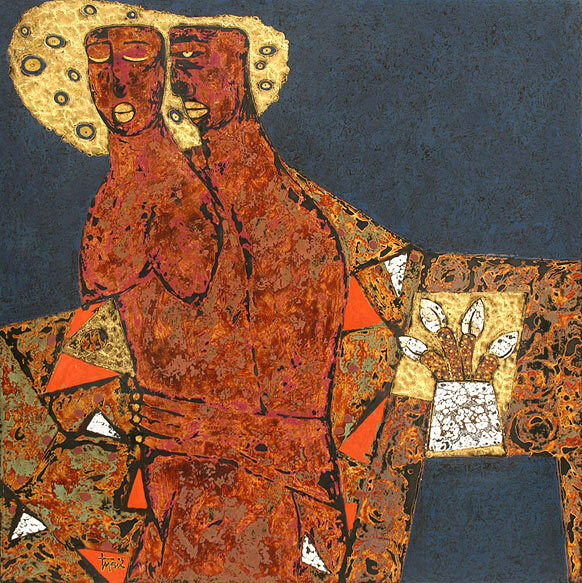 Thus, most works on paper are framed with an acid-free mat and covered with glass so the art work is in fact contained inside a protective box. Works on paper should be kept in dry places away from humidity which may cause mold growth or spots on the paper. Fastening works on paper by adhesive tape will cause brown spots over time to the paper and should be avoided. When a mat is used, it should be acid free since normal paper/cartoon often contains acids which are detrimental to the paper itself and can also cause discolouration to other pieces of paper adjacent to it. There are ways to restore damage to works on paper, but it requires careful assessment and technical skills and is thus a job for specialists in conservation measures.